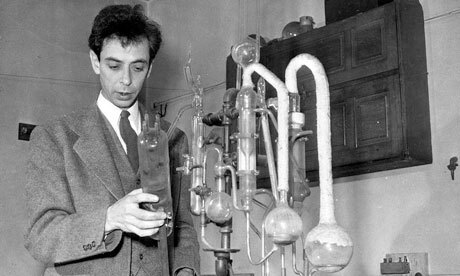 From Something Incredibly Wonderful Happens: Frank Oppenheimer and His Astonishing Exploratorium by K. C. Cole CODA: LIVING A FRUITFUL LIFE Speech to the 1960 graduating class of Pagosa Springs High School by Frank Oppenheimer I am grateful for the life I have lived. It has certainly not been as full as the lives of some people, and yet it has probably been richer in experience and in a sense of accomplishment than the lives of many. I think that part of the sense of having lived a full and a rich life comes from an inability to continually take things seriously—but not too personally. Of a willingness, even a determination, to become deeply involved in what you are doing, but not obsessed by it. What have you taken seriously? What has involved a lot of your attention, your time and worry: I can mention a tremendous variety of things: your school work, ball games, county fairs, science fairs, plays, concerts, talent shows, to name some of the obvious ones. But also some of you have been involved with a job or with the putting up of hay or doctoring sick animals. you have been concerned with events in your family, . . .
“One is not one’s own historian, let alone one’s own psychoanalyst.”—Thomas Kuhn, via a 1991 profile in Scientific American In 1962, Thomas Kuhn published The Structure of Scientific Revolutions, making good on an earlier monograph that ran in the International Encyclopedia of Unified Science. 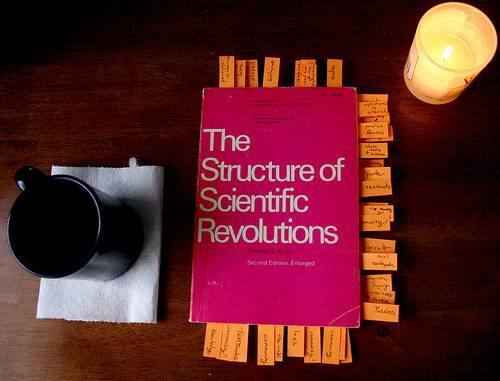 50 years later, “paradigm shift” is a ubiquitous reference for pomo and post-structuralist thinkers tinkering at the edges of science and culture, and we get our staid facts straight in deciphering one “Bad Newton” from another. For Kuhn, the drama of the paradigm shift really begins to unfold in times of crisis, when revolutionary science unveils challenging alternatives to then-dominant models, introducing a period of uncertain allegiances until the new paradigm is able to assert itself. The initial publication climate for Kuhn’s signature work was tenuous—the nation was soon-to-be knee-deep in the Cuban Missile Crisis, and had already weathered Federal Marshalls escorting James Meredith to classes at the University of Mississippi. Other soon-to-be cultural memes blotted the radar: the debut of The Incredible Hulk #1 Students for a Democratic Society’s draft of the “Port Huron Statement” John Lennon’s under-the-radar marriage to Cynthia Powell Johnny Carson’s semi-permanent takeover ofThe Tonight Show The Wizard of Oz’s last December telecast . 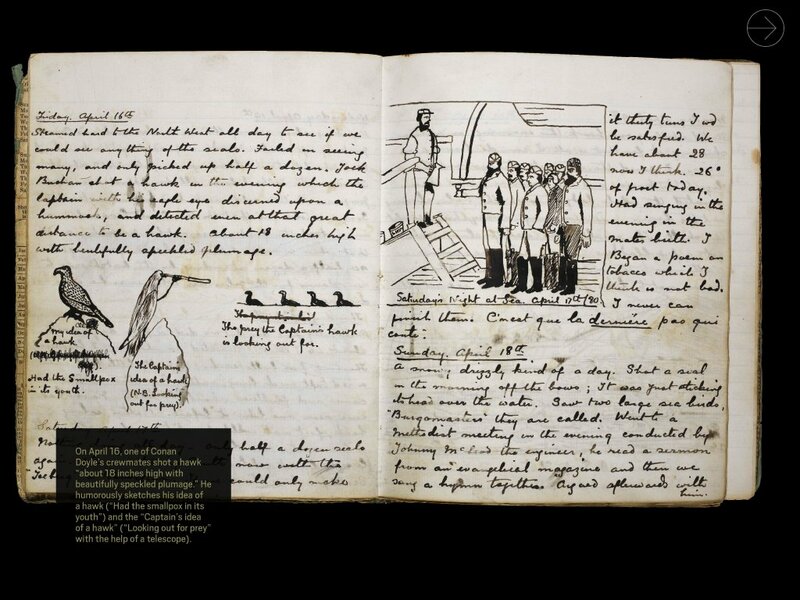 . .
From Dangerous Work: Diary of an Arctic Adventure, copublished by the British Library and the University of Chicago Press, which makes public for the first time Arthur Conan Doyle’s notebook and sketches from his time as a twenty-one-year-old ship’s surgeon on an Arctic whaler NB: Seals are clubbed. *** Thursday April 15th Beautifully fine day but we did a poor day’s work, about 46 I sink. 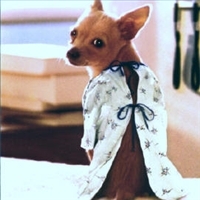 Assisted in shooting 2 bladders. They took five balls each. A pretty little bird with a red tuft on its head, rather larger than a sparrow came and fluttered about the boats. No one had ever seen on e like it before. Rather a long beak, feet not webbed, white underneath, with a “pea-wheet—pea-wheet.” A sort of Snowflake. Georgey Grant got his trousers torn by a young Sea Elephant in the evening. Friday April 16th Steamed hard to the North West all day to see if we could see anything of the seals. Failed in seeing many, and only picked up half a dozen. Jack Buchan shot a hawk in the evening which the Captain with his eagle eye discerned upon a hummock, and detected even at that great distance to be a hawk. . . .
September 19th marked two major birthdays for twentieth-century (and beyond) letters—and lucky are we to share in their celebration. The celebrated figures in question couldn’t be more distinct—Roger Grenier, a writer and champion of fine arts and culture, a former student of Gaston Bachelard, whose editorial finesse helped shape French publisher Gallimard into a global force, once described by the Guardian as possessing, “the best backlist in the world”; and Mike Royko (1932–97), Pulitzer Prize–winning Chicago newspaper columnist and author whose local-boy-does-good commentaries and investigative journalism became the mouthpiece of the city he called home. 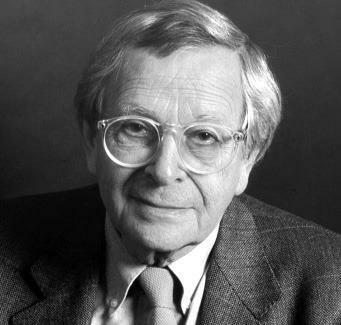 Grenier turned 93 on Wednesday, the same day his new collection of short stories Brefs récits pour une longue histoire was published in his native France. The author of more than thirty works of fiction, essay collections, and prose, Grenier is perhaps best known in the United States for the iconic vignettes on offer in The Difficulty of Being a Dog, translated by Alice Kaplan and published by the University of Chicago Press in 2000. This spring will usher in the publication of Grenier’s A Box of Photographs, and with it, his candid reflections on the history of photography. The depth and breadth of his . . . The dissemination of a war against terror has depended on a locution full of historical and contemporary ironies, for terror began its lexical life as the policy of the state, and wars are traditionally waged by states, so the war against terror can be (and has been) deciphered as the war of the state against itself. 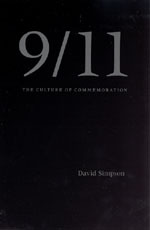 But international events are not the only sources of interruption of or distraction from the working out of memorial vocabularies for the dead of 9/11. There is also the ongoing negotiation between commerce and commemoration at the WTC site, a process that pits the declared obligations of memory and due respect against those of a future civic life, both economic and cultural. It is easy to cast the moguls of Manhattan as insensitive and materialistic, but the memorial process has also been aggressively suborned by the politicians, whose avowed respect for the dead is not beyond suspicions of present and future self-interest. Debates about the use of the site have not been unmarked by the assumption that the dead should bury the dead and thus by an embarrassingly hasty inclination to get on with life. Many residents have made it clear that they do . . . Walk into a low-income, minority school today, and you are likely to see halls plastered with the same optimistic slogans that have come to serve as fixtures in most American public schools. Walk into a classroom, however, and you are likely to see two unique realities that undermine those clichés: students mechanically preparing for standardized tests and teachers “teaching” from mandated instructional packages, otherwise known as scripted curricula. Written by private corporations that also serve as powerful lobbyists for school reform policy, these “teacher-proof” plans prescribe not just the content of a given lesson but every sentence that teachers will read off to their students in the course of a class. 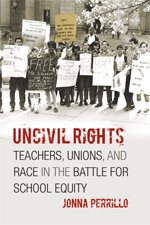 Accounts of teachers’ work with these curricula run from the ridiculous (the scripts allotting no time for teachers to repeat themselves) to the perverse (the common technique of call-and-response drills, a system of militaristic hand signals that accompanies one such program). In the words of Robert Slavin, creator of the Success for All Foundation, a supplier of premade curricula, scripted lessons promise not to “leave very much to chance” and instead offer a “relentless” approach to ensure productive activities “down to the level of minute-by-minute in the classroom.” The . . . Early September ushers in Labor Day, and with it, the unofficial end of summer. 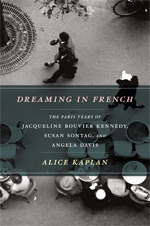 For Alice Kaplan, the John M. Musser Professor of French at Yale University, the summer may have appeared especially brusque, arriving on the heels of her recently published literary-cultural memoir Dreaming in French. The book, an animate portrayal of three iconoclastic American women—Angela Davis, Jacqueline Bouvier Kennedy, and Susan Sontag—during their ubiquitous junior-years abroad, explores the lures that the City of Light would cast on them in their formative years and beyond, from themes of seduction and escape to rising political consciousness and the struggle for selfhood. Kaplan spent a portion of July blogging her experiences in Algeria for the Best American Poetry blog, considering literary and political culture in light of the French colonial experience, and evaluating the changes facing the nation 50 years after it fully declared its independence from France: People like to say there was no Arab spring in Algiers because everyone was still traumatized by the violence in the 1990s. On the other hand, the “Place des martyrs”—the big gathering place at the base of the Casbah—is completely blocked off for public works (metro etc). And during the events in Tunisia, . . .